Don’t think Monday as the laziest day cause it’s the first day of the week and everybody should start the day perfectly. There are many people who has fear about Monday but it’s a silly matter. Don’t go with the laziness be strong and turn around, here we badge some Inspirational Monday Messages which will help you to eradicate your Monday fear! Read to increase yours and share to inspire your near and dear ones. A strong knot can be tied if both ends stretch forward equally, else either might slip away. Happy Monday! How many Monday’s have been and gone since you said I’ll start next week? Take action start today. Have a Rocking Monday! If God can move you from January to December, He will surely move you from Shame to Fame, Insults to Results, Sorry to Glory, Disgrace to Grace, Labor to Favor, Mockery to Victory and raise you from Glory to Glory. Happy Monday! It’s Monday, so choose to be happy and be yourself. If other people don’t like it, let them be. Remember, happiness is a choice, and life is not about pleasing everyone else. The Most Wonderful as well as king of Days It one and only Monday. 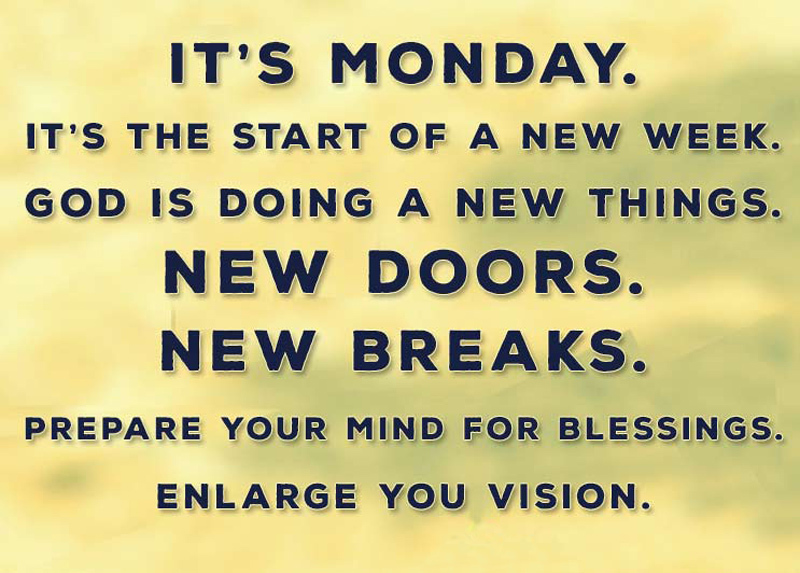 On this Day every one start His/Her new week. Happy Monday! Monday is a lot like a math problem. Add in the irritation, multiply the problems, subtract the sleep and divide the happiness. No day is Monday or Saturday itself, it’s your attire that lets you choose to excel or retreat. Happy Monday. You can’t start the next chapter of your life if you just keep re-reading the last one. Monday is your chance to start a new chapter and put the weekend behind you. Yes, it’s Monday. I’m happy. Yes, I’m blessed. I’m going to do amazing things this week. 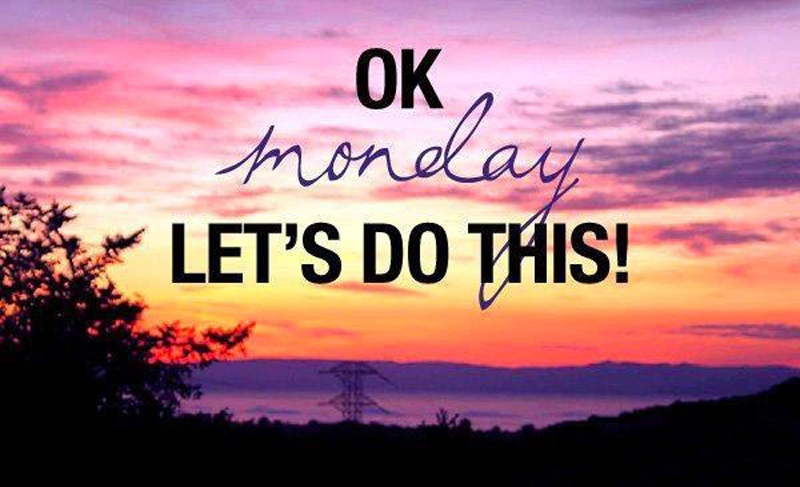 Monday is here to say all of us hey and with new ambitions to make us more Passionate! In the journey of life, we pass pleasures and pain. There will be sunshine and rain; There will be loss and gain. But we must learn to smile again and again. 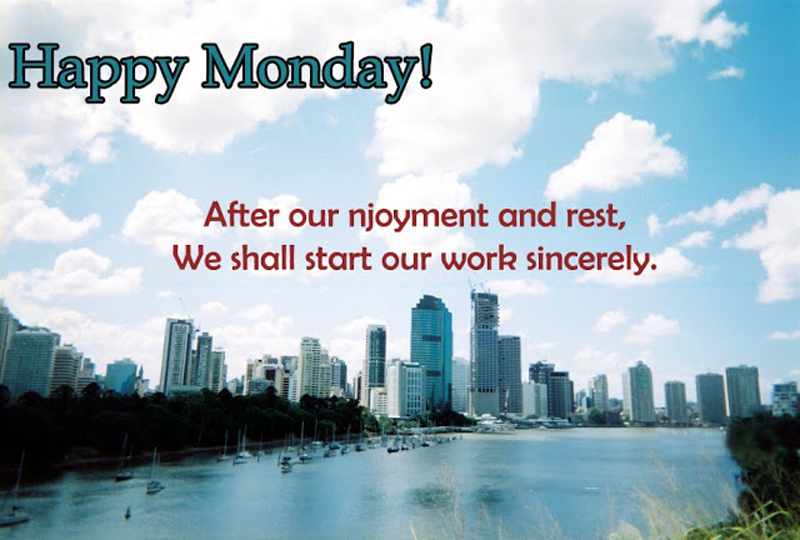 Have a joyful Monday! Wish you a great start of a week filled with motivation and inspiration of the work. Happy Monday. You can’t change what happened last week but you can learn from it and choose happiness this week. Happy Monday! Monday is a starting day of any Office work. Be ready for Monday and as well Work for whole week. Monday means face new glories by accepting new challenges! Since long time various famous people express their motivational thoughts for giving others support to throw away Monday fear and getting inspired. In this section we have compiled such kind of Monday Inspirational Quotes that are able to give high motivation and huge mental strength. It doesn’t matter how many mistakes you make or how slow your progress is. You will still always be way ahead of everyone else who isn’t even trying. Monday is the day to set your pace for a productive and meaningful working week. Just go ahead with all you have to excel. Happy Monday. The best way to predict the future is to create it. In some cases, it did not know the value of a moment until it becomes memory. Happy Monday! Keep your heart open to new dreams. As long as there’s a dream, there is hope. As long as there’s hope, there is joy in living. Today is Monday. I have one goal for you: to be so happy that when other people look at you, they get happy, too. Monday mean a new day With new hopes & new goals So don’t take tension and be ready! 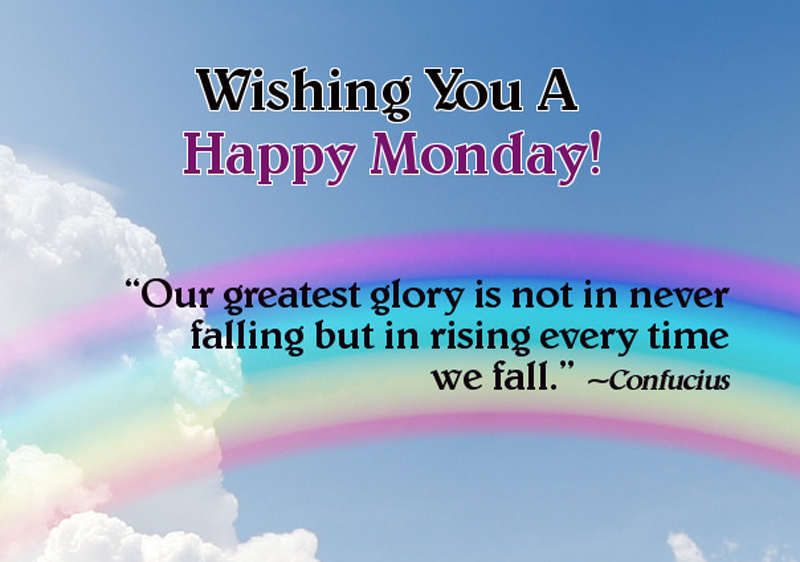 Monday means a shining day Just like day of full sun Without which day will be night! Smile today and say a kind word to a stranger. Take the time to close your eyes and enjoy each moment. 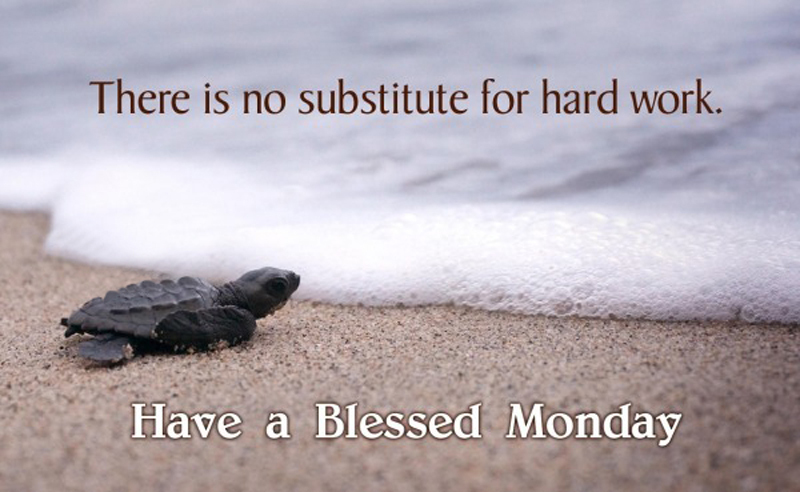 Have an amazing Monday everyone. Wish u Marvelous Monday, Tasty Tuesday, Victory Wednesday, Thankful Thursday, Friendly Friday, Successful Saturday and Superb Sunday. Have a great week ahead. 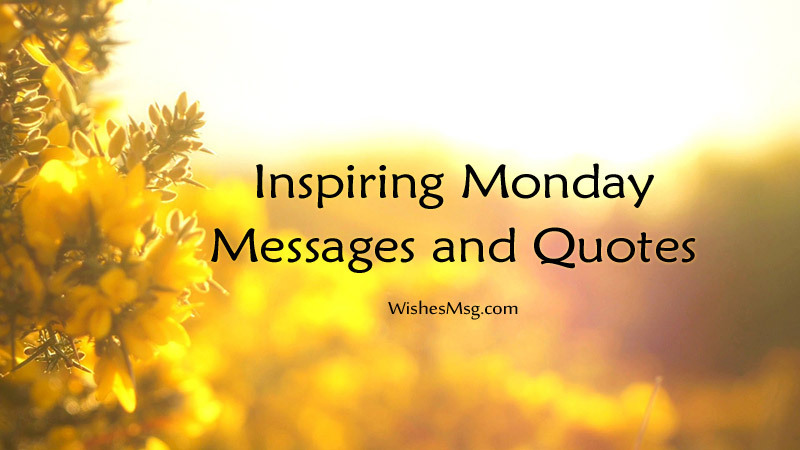 We pray hopefully that our compilation of Monday Inspirational Messages will fulfill your demand of search and surely these Monday Inspirational Messages are too helpful for encouraging anyone who have fear about Monday.